Why Did the Amphibian Cross the Road? Have you ever witnessed large numbers of salamanders and frogs crossing the road on rainy spring nights? Ever wonder where they came from and where they're going? The forests of New York are inhabited by a group of salamanders that are seldom seen, as they spend much of their time under leaves, moss, and rotting logs on the forest floor or in burrows created by small animals. Although elusive, these amphibians have important roles in our forest systems. This group includes spotted salamander, Jefferson salamander, blue-spotted salamander, and wood frog, all of which breed in woodland pools. In late winter and early spring, after the ground has started to thaw, these forest species emerge from underground winter shelters and walk overland to breed in woodland pools, a small, temporary wetland found in forests. These breeding migrations typically occur on rainy evenings when temperatures are above 40 F. these amphibians migrate to breeding pools by the hundreds, if not thousands. When conditions align just so, there can be explosive (“big night”) migrations, with hundreds of amphibians on the move. When these migratory pathways cross roads, Hudson Valley volunteers help them cross safely. 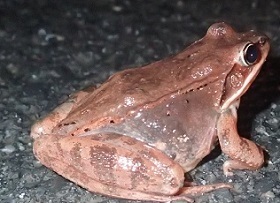 To learn more, visit DEC's Amphibian Migration & Road Crossings web page. While there, check out the new Volunteer Handbook, and subscribe to receive migration alerts and updates in the "DEC Delivers" box. Photos: wood frog and spotted salamander by Laura Heady.